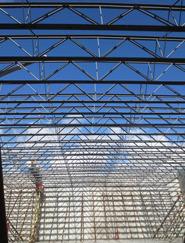 Joists are to be designed large enough to support the forecasted load over a long period of time to meet standards for metal joist stiffness The wider the span between the supporting metal joist structures, the deeper the joist will need to be if it is not to deflect under load. Lateral support, called “dwang,” also increases the joists’ overall strength and integrity over time. East Coast Metals will supply load tables in order to allow designers to select the proper joist sizes for their projects.